Enchanting vistas of snow-capped mountains, high mountain passes, deep valleys and gorges, lush meadows and thick coniferous forests, is how one can describe the wilderness of the Gangotri National Park-a high-altitude wildlife sanctuary situated in the Himalayas of Uttarakhand. The picturesque national park is the third largest national park in India. Spanning over an area of 2300 sq km, the altitude of this Himalayan national park ranges from 1800 m to 7000 m above mean sea level. Idyllically, nestled in the tranquil surroundings of the mesmerising town of Uttarkashi, it falls under the biogeographical zone. Uttarakhand is fondly called Dev Bhoomi, which means 'land of gods', and is blessed with natural beauty. And one can see plenty of fir, deodar, spruce, oak and rhododendron forests with a backdrop of tall mountains of the Himalayan ranges. Journey on the mountainous roads are truly a refreshing sight. The national park is home to rich flora and fauna, including some extremely rare and exotic species of plants, animals and birds. 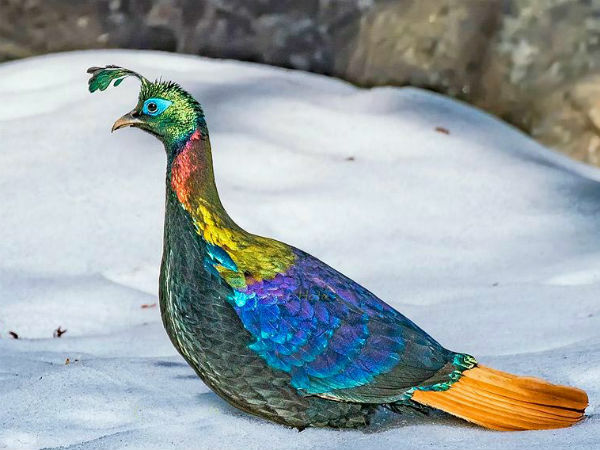 The elusive snow leopard, musk deer, brown bear, blue sheep and Himalayan monal are some of the rare and endangered species found in the national park. With stunning snowy mountains, Gangotri National Park also houses some of the magnificent glaciers including the Gaumukh, which is where the river Ganges originates from. Some of the many glacial rivers originate from the craggy glaciers located deep inside the park. Each year the national park draws many travellers, wildlife enthusiasts, trekkers and adventurers. Gaumukh, Gangotri, Bhojwasa and Chirbasa are some of the very popular and challenging treks that attract the daredevils. A cold, desert valley of Nelong is nothing short of a surreal spot. The high-altitude lake of Kedartal and the barren land of Tapovan are extremely scenic and captivating spots in the national park. Legends tagged with the epic of Mahabharata can be heard and places associated with the story can be seen on the treks or visits to the temples located in the region. These spots are not just scenic but also have a mystical aura that will leave you spellbound. For the spiritually inclined, the shrine of Gangotri-which is one of the Char Dham or four holy shrines-is a must visit. Spring to early summer months of April - May and late monsoon months of September - October are ideal for visiting the national park. Though the peak season is April - October, it is advisable to avoid the monsoon travel here, because of landslides and heavy rains around the time. Winter gets extremely cold and uninhabitable and many villagers migrate to lower altitudes. The Gangotri shrine is also closed during the six months when the snow falls in the region. The best way to reach Gangotri National Park is by reaching Dehradun, which is around 300 km away, and travelling by road in a hired taxi. Dehradun city has an airport and a railway station and is well connected with major cities of the country. It is advisable to hire a vehicle than self-drive as the roads are tricky and challenging here. Also, the routine of starting early and reaching early at the destination must be followed as the weather in the mountains is unpredictable.